On 8 March 1965 the US Marines waded ashore near Da Nang in South Vietnam, to guard the nearby airfield from attacks by the Viet Cong. The Marines, and most Americans assumed the situation would be resolved in a few months, never realising that it would be ten years and 58,000 deaths later before the last Americans left the war-torn country. With that first group of US Marines was nineteen-year-old, Connemara-born Pat Nee. 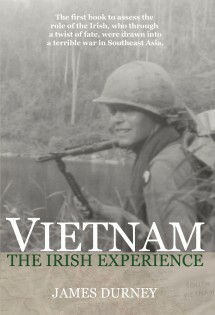 Irishmen Mike Kelly, Ed Somers and Dan Danaher arrovied weeks later as the Americans and their Australians allies committed more troops to stem the communist tide, and while Mike Cahill was running the blockade into North Vietnam that summer hundreds more of his countrymen were arriving in South Vietnam with the American Armed Forces. For some it would be a fatal journey. In nearly a decade of some of the most savage battles of the twentieth century the conflict in Southeast Asia would claim the lives of twenty-eight Irishmen and Women.